The Milton Keynes Win-Dor team have been at it once again recently, this time helping a local couple in Old Stratford improve the outward appearance of their property. When receiving a bespoke and first-hand service from our team however, efficiency as well as great style was also on the home improvement menu. Needless to say it was an easy and hassle-free process, both for Mr & Mrs Grant as well as our knowledgeable team. Prior to the actual installation itself, Mr & Mrs Grant made it clear to us when discussing that they were tired with their home’s original windows and doors, being too old fashioned for their newfound taste. They wished to reinvent how both guests and passers-by interpreted their home’s outward style, tasking us at Win-Dor to breathe new life into the Old Stratford home. 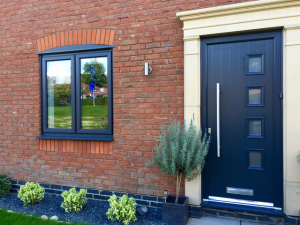 In line with the Grant family’s home improvement budget and desires, we eventually agreed that our range of high performance uPVC products were the best choice for the project, being highly flexible in terms of design to truly let the homeowners get creative. A vivid yet unobtrusive Anthracite Grey turned out to be the perfect choice, especially since that they would be resistant to fading for at least 10 years! Thanks to an internal multi-chambered uPVC design, heat can better be trapped within the frames of the Grant family’s new windows and door. Whereas previously unwanted draughts and cold spots could easily seep through, comfort can now easily be guaranteed. Fitted with high security multi-point locks, safety from intruders as well as the cold is now a certainty. Because the new products have been installed in such a neutral colour with Anthracite Grey, the couple’s home will stay looking fresh yet distinct for many years to come. Against the property’s red brick-based aesthetic, the windows and door successfully pop to catch the eye as will always be the case, letting natural light enter for great visuals inside as well as out. We always take pride in the work we do, and this is all the more present when customers such as Mr & Mrs Grant tell us just how pleased they are with the end result. 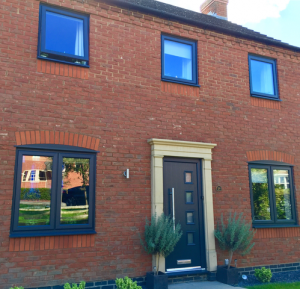 Our team were equally as pleased, feeling confident that the quality of the new windows and door could only be rivalled by the level of customer service they had delivered. If you’d like to replace your home’s existing and dilapidated double glazing like the Grants did, contact us to discuss your intentions. Call your local friendly Win-Dor team or send us an online message today.